By attending an event hosted by the Orange County Convention Center (OCCC), The Center of Hospitality, attendees support one of the most innovative, large-scale sustainability programs in the United States. The OCCC has demonstrated industry and community leadership by pioneering pathways for large venues to achieve continuously improving levels of sustainability stewardship. 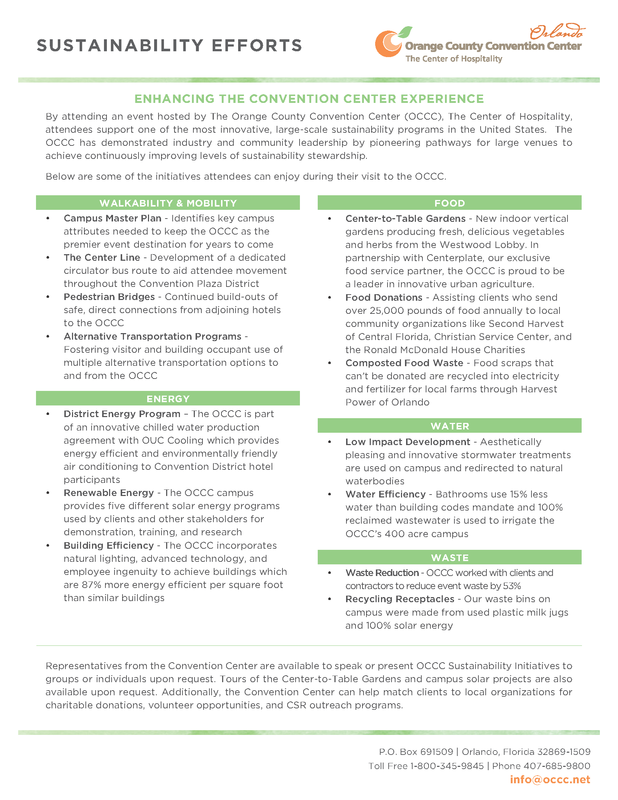 Below are some of the initiatives attendees can enjoy during their visit to the OCCC. Center-to-Table Gardens - New indoor vertical gardens producing fresh, delicious vegetables and herbs from the Westwood Lobby. In partnership with Centerplate, our exclusive food service partner, the OCCC is proud to be a leader in innovative urban agriculture. District Energy Program – The OCCC is part of an innovative chilled water production agreement with OUC Cooling which provides energy efficient and environmentally friendly air conditioning to Convention District hotel participants. Renewable Energy - The OCCC campus provides five different solar energy programs used by clients and other stakeholders for demonstration, training and research. 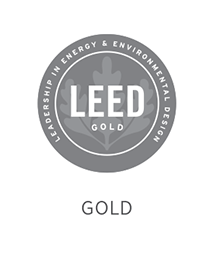 Building Efficiency - The OCCC incorporates natural lighting, advanced technology and employee ingenuity to achieve buildings which are 87% more energy efficient per square foot than similar buildings. Low Impact Development - Aesthetically pleasing and innovative stormwater treatments are used on campus and redirected to natural waterbodies. Water Efficiency - Bathrooms use 15% less water than building codes mandate and 100% reclaimed water is used to irrigate the OCCC's 400 acre campus. Waste Reduction - OCCC works with clients and contractors to reduce event waste by 53% since 2004. Recycling Receptacles - Our recycling and waste bins on campus were made from used plastic milk jugs and 100% solar energy.